1Denmark has no civil national motto, however the motto "Guds hjælp, Folkets kærlighed, Danmarks styrke" was adopted by Queen Margrethe II as her personal, royal motto. 2German is recognised as a protected minority language in the South Jutland (Sønderjylland) area of Denmark. Denmark borders the Baltic Sea on the southeast and the North Sea on the west, and a majority of its land mass lies on a peninsula named Jutland that protrudes northward from northern Germany between the two seas. The remainder of the territory consists of many islands, including a few relatively large ones, such as Zealand, Funen, and Bornholm. Zealand, which is well to the east of Jutland, has the largest and densest concentration of the Danish population, centering on the national capital, Copenhagen. Germany is Denmark's only land neighbor, but Norway lies about 140 km to the north across a branch of the North Sea called the Skagerrak and Sweden lies both to the east, across a narrow strait off Zealand called The Sound, and northeast, across a 70 km-wide body of water named the Kattegat. Sweden is visible from Copenhagen on a clear day. Denmark is a liberal democracy and constitutional monarchy. It is a member of NATO and the European Union although it retains its own currency and has various other exceptions from EU treaties. 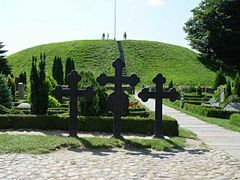 Historically it is best known for being the home of the Vikings who invaded and settled in many parts of Europe and Russia. At the same time the Vikings created an advanced trade system reaching through the Russian rivers as far as Constantinople. Since then it has been one of the more liberal European states and during the German occupation ensured that its Jewish community was saved. Originally a seafaring nation relying on fishing, farming and trade, Denmark experienced steady industrialization in the nineteenth and twentieth centuries and developed the Scandinavian model welfare state. In 2006 and 2007, surveys ranked Denmark as "the happiest place in the world," based on standards of health, welfare, and education. Map showing location of Zealand within Denmark. Denmark's area, slightly above 43,000 km², is about the same as Massachusetts and Connecticut combined. Its population, at nearly 5.5 million, is about the size of Wisconsin's. Until 1848, Denmark's southern border lay approximately 40 km farther south than it does today. This area, known as Schleswig-Holstein, was lost in an armed clash with Prussia. Many of the larger islands are connected by long bridges. One, actually a bridge/tunnel system, connects Copenhagen with Sweden's third-largest city, Malmö, at The Sound's widest expanse. Another spans the gap between Zealand and Funen, carrying rail as well as highway traffic. The construction on both was finished in the late 1990s. The smaller distance between Jutland and Funen was bridged in two places in the 1930s and 1970s. A plan for a bridge exists to connect the southern island of Lolland, south of Zealand, to Germany. Surface connection to the smaller islands, including Bornholm, is by ferry. Denmark is one of the world's flattest countries. There is little elevation to the Danish landscape at all; the highest point is a nondescript hill in the middle of Jutland, at 171 meters. The climate is generally temperate, with mild winters and cool summers. The seas that nearly surround the country are a great moderating influence. Because of the proximity to the water, no one in Denmark lives more than 52 km from the sea. There are two Crown territories of Denmark, both well to the west of the mainland and each allowed political home rule: Greenland, the world's largest island, and the Faeroe Islands, located approximately midway between Norway and Iceland. 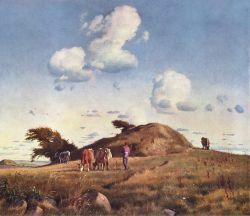 Hankehøj, by Johan Lundbye. A Danish down. Note the glacial character of the terrain and the burial mound of an early chief in the center. The earliest archaeological findings in Denmark date back to 130,000 – 110,000 B.C.E. in the Eem interglacial period. People have inhabited Denmark since about 12,500 B.C.E. and agriculture has been in evidence since 3,900 B.C.E. The Nordic Bronze Age (1,800–600 B.C.E.) in Denmark was marked by burial mounds, which left an abundance of findings including lurs and the Sun Chariot. During the Pre-Roman Iron Age (500 C.E. – 1 C.E. ), native groups began migrating south, although the first Danish people came to the country between the Pre-Roman and the Germanic Iron Age, in the Roman Iron Age (1–400 C.E.). The Roman provinces maintained trade routes and relations with native tribes in Denmark and Roman coins have been found in Denmark. 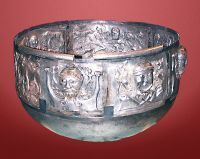 Evidence of strong Celtic cultural influence dates from this period in Denmark and much of northwest Europe and is among other things reflected in the finding of the Gundestrup cauldron. Historians believe that before the arrival of the precursors to the Danes, who came from the east Danish islands (Zealand) and Skåne and spoke an early form of north Germanic, most of Jutland and some islands were settled by Jutes. They later migrated to the British isles, together with Angles and Saxons to form the Anglo-Saxons. The exact origins of the Danish nation have been lost in history. However, a short note about the Dani in "The Origin and Deeds of the Goths" from 551 by historian Jordanes is believed by some to be an early mention of the Danes, one of the ethnic groups from whom the modern Danish people are descended. The Danevirke defense structures were built in phases from the third century forward, and the sheer size of the construction efforts in 737 are attributed to the emergence of a Danish king. The new runic alphabet was first used at the same time and Ribe, the oldest town of Denmark, was founded about 700 C.E. During the eighth-eleventh centuries, the Danes were known as Vikings, together with Norwegians and Swedish Geats. Viking explorers first discovered and settled Iceland in the ninth century, on their way toward the Faeroe Islands. From there, Greenland and Vinland (Newfoundland) were also settled. 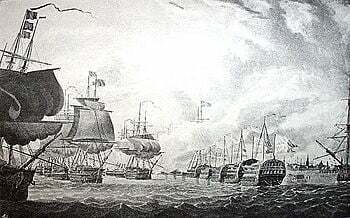 Utilizing their great skills in shipbuilding, they raided and conquered parts of France and the British Isles. But they also excelled in trading along the coasts and rivers of Europe, running trade routes from Greenland in the north to Constantinople in the south via Russian rivers. The Danish Vikings were most active in the British Isles and Western Europe, and they raided, conquered and settled parts of England (their earliest settlements included Danelaw, Ireland, France and Normandy). In the early eighth century, Charlemagne's Christian empire had expanded to the southern border of the Danes, and Frankish sources (F.ex. Notker of St Gall) provide the earliest historical evidence of the Danes. These report a King Gudfred, who appeared in present day Holstein with a navy in 804 C.E. where diplomacy took place with the Franks; In 808, the same King Gudfred attacked the Obotrite, a Wend people and conquered the city of Reric whose population was displaced or abducted, to Hedeby; In 809, King Godfred and emissaries of Charlemagne failed to negotiate peace and the next year, 810, King Godfred attacked the Frisians with 200 ships. The oldest parts of the defensive works of Dannevirke near Hedeby at least date from the summer of 755 and were expanded with large works in the tenth century. The size and amount of troops needed to man it indicates a quite powerful ruler in the area, which might be consistent with the kings the Frankish sources. In 815 C.E., Emperor Louis the Pious attacked Jutland apparently in support of a contender to the throne, perhaps Harald Klak, but was turned back by the sons of Godfred, who likely were the sons of the above mentioned Godfred. At the same time Saint Ansgar traveled to Hedeby and started the Catholic Christianization of Scandinavia. The Danes were united and officially Christianized in 965 C.E. by Harald Blåtand, the story of which is recorded on the Jelling stones. The exact extent of Harald's Danish Kingdom is unknown, although it's reasonable to believe that it stretched from the defensive line of Dannevirke, including the Viking city of Hedeby, across Jutland, the Danish isles and into southern present day Sweden; Skåne and perhaps Halland and Blekinge. Furthermore the Jelling stones attests that Harald had also "won" Norway. The son of Harald, Sweyn I mounted a series of wars of conquest against England, which was completed by Svend's son Canute the Great by the middle of the eleventh century. The reign of Knud represented the peak of the Danish Viking age. King Knud's North Sea Empire included Denmark (1018), Norway (1028), England (1035) and held strong influence over the north-eastern coast of Germany. From the Viking age towards the end of the thirteenth century, the kingdom of Denmark consisted of Jutland, north from the Elder River and the islands of Zealand, Funen, Bornholm, Skåne, Halland and Blekinge. From the end of the thirteenth century the lands between Eider River and the river Kongeåen were separated from the kingdom as two vassal duchies of Schleswig and Holstein. In 1658 Skåne, Halland and Blekinge were ceded to Sweden. 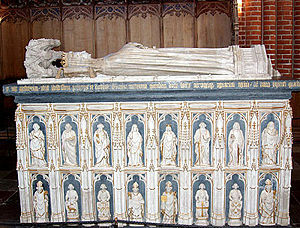 The tomb of Margrethe I in Roskilde Cathedral. Following the end of the eleventh century, Denmark underwent a transition from a decentralized realm with a weak and semi-elected royal institution and little to no nobility, into a realm which more reflected European feudalism, with a powerful king ruling through an influential nobility. The period is marked by internal strife and the generally weak geopolitical position of the realm, which for long stretches fell under German influence. The period also featured the first large stone buildings (mostly churches), a deep penetration by the Christian faith, the appearance of monastic orders in Denmark and the first written historical works such as the Gesta Danorum ("Deeds of the Danes"). German political as well as religious influence firmly ended in the last decades of the twelfth century under the rule of King Valdemar the Great and his foster brother Absalon Hvide, Archbishop of Lund; through successful wars against the Wend peoples of northeast Germany and the German Empire. Valdemar's daughter Ingeborg married Philip II of France. Although she was crowned Queen of France in 1193, for some unknown reason King Philip Augustus repudiated her and incarcerated her for 20 years in a convent while he attempted to have his marriage annulled. Pope Innocent III upheld Ingeborg's claims. This caused conflicts in Europe which involved several countries and two popes. A high point was reached during the reign of Valdemar II, who led the formation of a Danish "Baltic Sea Empire," which by 1221 extended control from Estonia in the east to Norway in the north. In this period several of the "regional" law codes were given; notably the Code of Jutland from 1241, which asserted several modern concepts like right of property; "that the king cannot rule without and beyond the law"; "and that all men are equal to the law." Following the death of Valdemar II in 1241 and to the ascension of Valdemar IV in 1340, the kingdom was in general decline due to internal strife and the rise of the Hanseatic League. 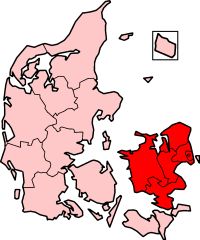 The competition between the sons of Valdemar II, had the long term result that the southern parts of Jutland were separated from the kingdom of Denmark and became semi-independent vassal duchies/counties. During the reign of Valdemar IV and his daughter Margrethe I, the realm was re-invigorated and following the Battle of Falköping, Margrethe I had her sister's son, Eric of Pomerania crowned King of Denmark, Norway and Sweden after the signing of the union charter of Kalmar (The Kalmar Union), Trinity Sunday 1397. Much of the next 125 years of Scandinavian history revolves around this union, with Sweden breaking off and being re-conquered repeatedly. The issue was for practical purposes resolved on the June 17, 1523 as Swedish King Gustav Vasa conquered the city of Stockholm. Denmark and Norway remained in a personal union until the Congress of Vienna, 1814. The Protestant Reformation came to Scandinavia in the 1530s, and following the Count's Feud civil war, Denmark converted to Lutheranism in 1536. King Christian IV attacked Sweden in the 1611–1613 Kalmar War but failed to accomplish his main objective of forcing Sweden to return to the union with Denmark. The war led to no territorial changes, but Sweden was forced to pay a war indemnity of 1 million silver riksdaler to Denmark, an amount known as the Älvsborg ransom. King Christian used this money to found several towns and fortresses, most notably Glückstadt (founded as a rival to Hamburg) and Christiania. Inspired by the Dutch East India Company, he founded a similar Danish company and planned to claim Sri Lanka as a colony but the company only managed to acquire Tranquebar on India's Coromandel Coast. In the Thirty Year's War, Christian tried to become the leader of the Lutheran states in Germany, but suffered a crushing defeat at the Battle of Lutter resulting in a Catholic army under Albrecht von Wallenstein occupying and pillaging Jutland. Denmark managed to avoid territorial concessions, but Gustavus Adolphus' intervention in Germany was seen as a sign that the military power of Sweden was on the rise while Denmark's influence in the region was declining. In 1643, Swedish armies invaded Jutland and in 1644 Skåne. In the 1645 Treaty of Brømsebro, Denmark surrendered Halland, Gotland, the last parts of Danish Estonia, and several provinces in Norway. In 1657, King Frederick III declared war on Sweden and marched on Bremen-Verden. This led to a massive Danish defeat and the armies of King Charles X Gustav of Sweden conquered both Jutland, Funen and much of Zealand before signing the Peace of Roskilde in February 1658 which gave Sweden control of Skåne, Blekinge, Trøndelag and the island of Bornholm. Charles X Gustav quickly regretted not having destroyed Denmark completely and in August 1658 he began a two-year long siege of Copenhagen but failed to take the capital. In the following peace settlement, Denmark managed to maintain its independence and regain control of Trøndelag and Bornholm. Denmark tried to regain control of Skåne in the Scanian War (1675-1679) but it ended in failure. Following the Great Northern War (1700–1721), Denmark managed to restore control of the parts of Schleswig and Holstein ruled by the house of Holstein-Gottorp in 1721 and 1773, respectively. Denmark prospered greatly in the last decades of the eighteenth century due to its neutral status allowing it to trade with both sides in the many contemporary wars. In the Napoleonic Wars, Denmark originally tried to pursue a policy of neutrality to continue the lucrative trade with both France and the United Kingdom and joined the League of Armed Neutrality with Russia, Sweden and Prussia. The British considered this a hostile act and attacked Copenhagen in both 1801 and 1807, in one case carrying off the Danish fleet, in the other, burning large parts of the Danish capital. These events mark the end of the prosperous Florissant Age and resulted in the Dano-British Gunboat War. British control over the waterways between Denmark and Norway proved disastrous to the union's economy and in 1813, Denmark-Norway went bankrupt. The post-Napoleonic Congress of Vienna demanded the dissolution of the Dano-Norwegian union, and this was confirmed by the Treaty of Kiel in 1814. Denmark-Norway had briefly hoped to restore the Scandinavian union in 1809, but these hopes were dashed when the estates of Sweden rejected a proposal to let Frederick VI of Denmark succeed the deposed Gustav IV Adolf and instead gave the crown to Charles XIII. Norway entered a new union with Sweden which lasted until 1905. Denmark kept the colonies of Iceland, Faeroe Islands and Greenland. Apart from the Nordic colonies, Denmark ruled over Danish India (Tranquebar in India) from 1620 to 1869, the Danish Gold Coast (Ghana) from 1658 to 1850, and the Danish West Indies (the U.S. Virgin Islands) from 1671 to 1917. The Danish liberal and national movement gained momentum in the 1830s, and after the European Revolutions of 1848 Denmark peacefully became a constitutional monarchy in 1849. After the Second War of Schleswig (Danish: Slesvig) in 1864, Denmark was forced to cede Schleswig and Holstein to Prussia, in a defeat that left deep marks on the Danish national identity. After these events, Denmark returned to its traditional policy of neutrality, also keeping Denmark neutral in World War I. Following the defeat of Germany, the Versailles powers offered to return the then-German region of Schleswig-Holstein to Denmark. Fearing German irredentism, Denmark refused to consider the return of the area and insisted on a plebiscite concerning the return of Schleswig. The result of the plebiscite was that Northern Schleswig (Sønderjylland) was recovered by Denmark, thereby adding 163,600 inhabitants and 3,984 km². The reunion day (Genforeningsdag) is celebrated every year on June 15. During the German occupation, King Christian X became a powerful symbol of national sovereignty. This image dates from the King's birthday, September 26, 1940. Note the lack of a guard. Despite its declaration of neutrality at the beginning of World War II, and the conclusion of a non-aggression agreement with Nazi Germany, Denmark was invaded by Nazi Germany (Operation Weserübung) on April 9, 1940 and occupied until May 5, 1945. The Faeroe Islands and Iceland were, however, occupied by British forces in April 1940 in a pre-emptive move to prevent a German occupation. Iceland became a fully independent republic in 1944; previously the Danish monarch had also been King of Iceland. The occupation of Denmark was unique in that the terms of occupation were initially very lenient (although the Communist party was banned when Germany invaded the Soviet Union). The new coalition government attempted to protect the population from Nazi rule through compromise. 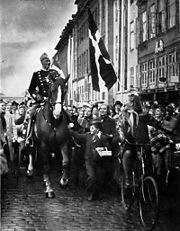 The Folketing was allowed to remain in session, the police remained under Danish control, and the Nazi German authorities were one step removed from the population. However, the Nazi German demands eventually became intolerable for the Danish government, so in 1943 it resigned and Germany assumed full control of Denmark. After that point, an armed resistance movement grew up against the occupying forces. Toward the end of the war, Denmark grew increasingly difficult for Nazi Germany to control, but the country was not liberated until Allied forces arrived in the country at the end of the war. Also notable was the relocation of most Danish Jews to Sweden in 1943 when Nazi forces threatened deportation. In 1948 the Faeroe Islands were granted home rule. 1953 saw further political reform in Denmark, abolishing the Landsting (the elected upper house), colonial status for Greenland and allowing the female right of succession to the throne with the signing of a new constitution. After the war, with the perceived threat posed by the USSR and the lessons of World War II still fresh in Danish minds, the country abandoned its policy of neutrality. Denmark became a charter member of the United Nations in 1945 and one of the original members of the North Atlantic Treaty Organisation in 1949 (though Denmark had originally tried to form an alliance only with Norway and Sweden). A Nordic Council was later set up to coordinate Nordic policy. Later, in a referendum in 1972, Danes voted yes to joining the European Community, the predecessor of the European Union, and became a member January 1, 1973. Since then, Denmark has been a hesitant member of the European community, opting out of many proposals, including the Euro which was rejected in a referendum in 2000. The Kingdom of Denmark is a constitutional monarchy. As stipulated in the Danish Constitution, the monarch is not answerable for his or her actions, and his or her person is sacrosanct. The monarch appoints and dismisses the Prime Minister and other ministers. Before being validated through royal assent, all bills and important government measures must be discussed in Statsrådet, a privy council headed by the monarch. The Danish privy council's protocols are secret. While executive authority belongs to the monarch (as head of state), legislative authority is vested in the executive (Prime Minister) and the Danish parliament conjointly. Judicial authority lies with the courts of justice. The Folketing is the national legislature. It has the ultimate legislative authority according to the doctrine of parliamentary sovereignty, however questions over sovereignty have been brought forward because of Denmark’s entry into the European Union. In theory however, the doctrine prevails. Parliament consists of 179 members elected by proportional majority. Parliamentary elections are held at least every four years, but it is within the powers of the Prime Minister to call one at his discretion before this period has elapsed. On a vote of no confidence the Folketing may force a single minister or the entire government to resign. The Danish political system has traditionally generated coalitions, which themselves have sometimes been minority coalitions ruling with parliamentary support. Since November 2001, the Danish Prime Minister has been Anders Fogh Rasmussen from the Venstre party, a center-right liberal party. The government is a coalition consisting of Venstre and the Conservative People's Party, with parliamentary support from the Danish People's Party (Dansk Folkeparti). The three parties obtained a parliamentary major in the 2001 elections and maintained it virtually unchanged in the 2005 election. On 24 October 2007 an early election was called by the Prime Minister for 13 November. Following the election the Danish People's party was strengthened while Mr. Anders Fogh Rasmussen's Venstre lost 6 mandates and the Conservative Party retained the same amount of seats in Parliament as prior to the election. The result ensured that Anders Fogh Rasmussen could continue as Prime Minister for a third term. The Reformed Church recognized by the state since 1682. Det Mosaiske Troessamfund, the main Jewish organization in Denmark, recognized by the state since 1682. Religion, religious societies, and churches do not need to be state-recognized in Denmark and can be granted the right to perform weddings and other rites without this recognition. Denmark's market economy features very efficient agriculture, up-to-date small-scale and corporate industry, extensive government welfare measures, very high living standards, a stable currency, and high dependence on foreign trade. Denmark is a net exporter of food and energy and has a comfortable balance of payments surplus and zero net foreign debt. Also of importance is the sea territory of more than 105,000 km² (40,000+ sq mi). The Danish economy is highly unionized; 75 percent of its labor force are members of a trade union. Most trade unions take part in the organized system of trade unions, the organization at the highest level being the so-called LO, the Danish Confederation of Trade Unions. However, increasing numbers in the labor force choose not to become members of a trade union or to become members of one of the trade unions outside the organized system (often referred to as the yellow, in Danish gule, trade unions). Relationships between unions and employers are generally cooperative: unions often have a day-to-day role in managing the workplace, and their representatives sit on most companies' board of directors. Rules on work schedules and pay are negotiated between unions and employers, with minimal government involvement. In the area of sickness and unemployment, the right to benefit is always dependent on former employment and at times also on membership of an unemployment fund, which is almost always -but need not be- administered by a trade union, and the previous payment of contributions. However, the largest share of the financing is still carried by the central government and is financed from general taxation, and only to a minor degree from earmarked contributions. The Danish welfare model is accompanied by a taxation system that is both broad based (25 percent VAT and excise) and with high income tax rates (minimum tax rate for adults is 39.6 percent). Denmark is home to many multi-national companies, among them: A. P. Moller-Maersk Group (Maersk - international shipping), Lego (children's toys), Bang & Olufsen (hi-fi equipment), Carlsberg (beer), Vestas (wind turbines), and the pharmaceutical companies Lundbeck and Novo Nordisk. Main exports include: Animal Foodstuffs, Chemicals, Dairy Products, Electronic Equipment, Fish, Furniture, Leather, Machinery, Meat, Oil and Gas, and Sugar. The majority of the population is of Scandinavian descent, with small groups of Inuit (from Greenland), Faroese, and immigrants. Immigrants make up close to 10 percent of the total population, mostly coming from neighboring northern European countries, but a growing number originate from southern Europe and the Middle East. In recent years this has caused increasing tension as Danes feel their liberal society is under threat from a non-liberal Muslim Arab minority. In 2007 the publication of cartoons of the prophet Muhammad caused serious disturbances around the world. As in most countries, the population is not distributed evenly. Although the land area east of the Great Belt only makes up 9,622 km² (3,715 sq mi), 22.7 percent of Denmark's land area, it has just under half of the population. Danish is spoken in the entire country, although a small group near the German border also speaks German. Many Danes are fluent in English as well, particularly those in larger cities and young people, who are taught it in school. Nearly seven out of eight Danes are members of the state church, the Evangelical Lutheran Church, also known as the Church of Denmark. In fact, at birth all Danes are considered to belong to the national church. The rest are primarily of other Christian denominations, and about 2 percent are Muslims. For the last decade, the Church of Denmark has seen a decline in its membership. In recent years, a resurgence of neopaganism in Europe has occurred; some religious groups celebrating old Viking gods have appeared. In Denmark, Forn Siðr (Asa and Vane faith religious community) a legally recognized faith society since 2003, meaning they have rights to conduct weddings, etc. The most well-known Dane around the world is probably Hans Christian Andersen, a nineteenth-century writer famous for such children's stories as The Emperor's New Clothes, The Little Mermaid, and The Ugly Duckling. Other internationally known authors include Karen Blixen (pen name: Isak Dinesen) and Nobel laureate author Henrik Pontoppidan. 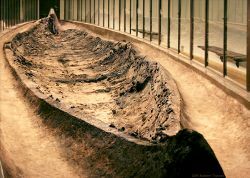 Many Danes were sailors who explored the North Atlantic and may have discovered America before Columbus. The most famous of these explorers was Vitus Bering. He traveled east between 1728 and 1741 in the service of the Russian navy and discovered Alaska at the northwest end of the Americas in 1741, the last year of his life. He died on what was later named Bering Island, near Russia's Kamchatka Peninsula. His name also lives on in the Bering Sea and the Bering Strait. Before that, Tycho Brahe, who lived and worked in the part of southern Sweden, then part of Denmark, made important advances in the field of astronomy in the late seventeenth century. His achievements were based on the pioneering technique of making many repeated observations of the heavens and cataloging what he saw and measured. In his last years, his assistant was Johannes Kepler, a German who developed several astronomical theories from Tycho's data. Søren Kierkegaard, a philosopher and theologian of the nineteenth century, is generally recognized as the first existentialist writer. Much of his work was done in reaction to the Danish Church and the emptiness he felt there. He had a profound impact on later philosophers, particularly of the twentieth century. The most famous Danish scientist was Niels Bohr who was awarded the 1922 Nobel Prize for physics for his work on atomic structure and quantum mechanics. More recent achievements in the field of engineering include computer software where Danes have made significant contributions through Bjarne Stroustrup (inventor of C++) and Anders Hejlsberg (creator of Turbo Pascal, Delphi and the C# programming language). The Dane Janus Friis was one of the driving forces behind the invention of Skype. The culture of Denmark is hard to define. Nonetheless, there are some general characteristics often associated with Danish society and everyday culture. Danes are generally a reserved people, though they are often considered positively outgoing compared to their northern cousins in Norway and Sweden. Danes are fun loving, as a trip through any town on a Friday night can attest, but hard working when there's something to be done. Danes like the idea of 'civilized' nature. They are generally compassionate, articulate, and clean. Equality is an important part of Danish culture, so much so that, 'success' or what may be seen as a deliberate attempt to distinguish oneself from others may be viewed with hostility. This characteristic is called Janteloven or Jante's Law by Danes. Danes with the rest of their Nordic neighbors are known for enjoying an open-minded drinking culture. Recent studies has shown that Danish teenagers drink the most compared to the Nordic neighbors, such as Germans, Norwegians and Swedes. Compared to the US laws, the Danish laws are very different. Buying and drinking alcohol is legal at the age of 16, however this is not always enforced resulting in teens beginning drinking at lower ages, such as 13-14. However, driving is not allowed until the age of 18. Danes often disagree about the content and value of their culture and customs. In fact, one strong characteristic is their tendency to borrow easily from foreign cultures. If some cultural trait from overseas is seen and enjoyed firsthand by just a few people, it can spread and be adopted by the general population in a relatively short time. ↑ James B. Minahan, The Complete Guide to National Symbols and Emblems (Greenwood, 2009, ISBN 978-0313344961). ↑ Population figures from the censuses Statistics Denmark. Retrieved January 27, 2017. ↑ 3.0 3.1 3.2 3.3 Denmark International Monetary Fund. Retrieved January 27, 2017. ↑ Bill Weir and Sylvia Johnson, Denmark: The Happiest Place on Earth ABCNews Internet Ventures, January 8, 2007. Retrieved January 27, 2017. ↑ Jordanes, The Origin and Deeds of the Goths (BiblioBazaar, 2008, ISBN 1437509746). ↑ Denmark Altapedia Online. Retrieved January 27, 2017. Derry, T. K. A history of Scandinavia: Norway, Sweden, Denmark, Finland, and Iceland. Minneapolis: University of Minnesota Press, 1979. Ministry of Foreign Affairs of Denmark. In-depth description of Denmark Retrieved January 27, 2017. Petrow, Richard. The bitter years; the invasion and occupation of Denmark and Norway, April 1940-May 1945. New York: Morrow, 1974. This page was last modified on 26 October 2017, at 18:20.